This past weekend marked the opening of the 2008 Archery season in Tennessee. We were blessed with perfect bow hunting weather - about 60 degrees in the morning, warming to the low to mid 80s in the afternoon. Ted was the designated videographer and I got to hunt (sweet huh?). We were hunting a piece of property that I was only slightly familiar with and which Ted had never seen before. We got some good video of... well, you'll have to wait for part two to see it. Not because I'm trying to be dramatic, but because I had to leave town on a business trip and wasn't able to download the video before I left. So until I can get the video loaded, I'll talk about our scouting experience and the dominant trees we found. This weekend, it was all about the chestnut oaks. The white oaks are going to have good mast production this fall, but the acorns aren't ripe yet and are still holding tight on the trees. The red oaks are a casualty of the late freeze in the spring of 2007 and won't be producing much of anything at all this year. If that doesn't make sense to you check out this article and it will. Most of the persimmons we found were still green but we found one cluster of female trees with ripe fruit on the ground. The deer weren't feeding on them yet, however. We will keep checking on them, because it is only a matter of time before the deer find 'em. Check out the photo of the huge persimmon tree at the top of the page. We were pretty excited to find it, but unfortunately it turned out to be a male. The chestnut oaks, on the other hand, were raining nuts, and the deer were all over them. On the property we were hunting, chestnut oaks are fairly rare, so it took some looking to find them. We ended up doing a lot of cruising on the four wheelers and glassing with binoculars looking for the distinctive bark. 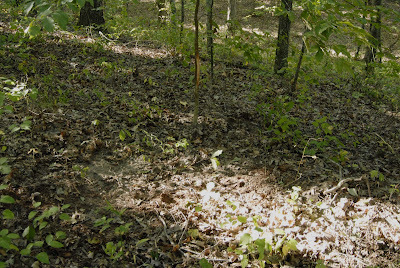 We found two spots with dominant trees, including one ridge that was absolutely torn up with feeding sign (broken up leaves and fresh deer droppings), scrapes, and rubs. It was one of the most impressive collections of deer sign that either of us has seen. Here are a couple photos that will give you an idea, but don't really do it justice. This is a closeup showing the broken up leaves and very fresh droppings (notice the wet surface) that indicate that deer had been feeding in this spot within the past twelve hours or so. This photo was taken in the morning, so the droppings were likely left the evening before or during the night, otherwise the surface would have dried out in the afternoon heat. So how did we do? Check back for Part 2 to find out.